Even with all the newfangled fly patterns and fly tying materials available today, I usually find myself sticking more with the old staples, or at least pretty similar variations. And I stick with them for one main reason: They work! 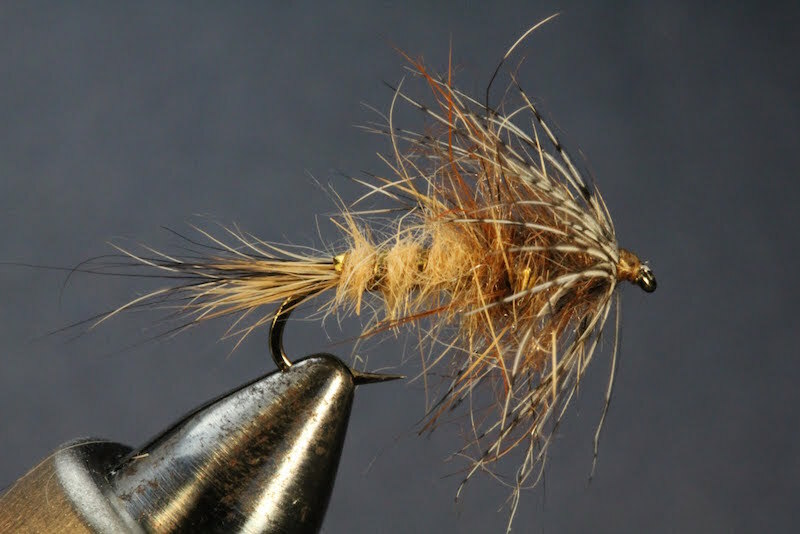 Created by fly tying guru, Dave Whitlock in the 1960’s, this fly definitely falls under the “old staple” category. As disappointing as this may be to some, the fly was not named for Redd Foxx of Sanford and Son. You big dummy! Rather, it got its name for the simple reason that it is tied mostly from the fur and hair of a red fox squirrel. We consider this an impressionistic fly. That means it’s designed to look alive or “buggy” more than imitating a specific food source. We also lump these sorts of flies in the categories of attractors or generals. 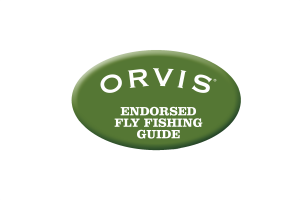 Or Orvis likes to call them prospecting flies. So really, it’s a pretty good fly to fish anytime in the Smokies. I think it is at it’s best in the early spring. I attribute that to the abundance of Quill Gordon nymphs in the water at that time. This impressionistic fly imitates that nymph as well as any other I’ve fished. I’ve had a lot of success with the traditional, light red version of this fly, but tie them in a few other colors as well. Different colors might better imitate other food sources in the water, but may also better imitate the color of Quill Gordon nymphs found in a specific river, or even a specific stretch of river. It’s hard to say just how selective these trout can get and how important it is to match the color of the nymph, but I’ve personally found Quill Gordon nymphs in Little River that range from a light reddish color, to tan, to grey, to dark reddish brown, to olive. 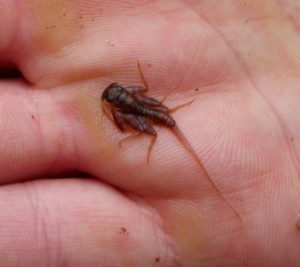 You can see that the Quill Gordon nymph in the picture has more of a dark reddish brown color. Though it’s probably more of a confidence thing, it seems that some years a certain color just works better than another. I like to fish double nymph rigs with two different colored nymphs until I zero in on their preference. In any case, these Quill Gordon nymphs are pretty robust, and the beefy body on the Red Fox Squirrel Nymph seems to suggest that better than, say, the slender profile of a Pheasant Tail Nymph. And the picked-out fur body and soft hackle provide a lot of subtle, life-like movement. A close cousin to the RFSN, is the Gold Ribbed Hare’s Ear Nymph. This is another one of those staple flies that is really simple to tie and you can be find it in most any fly shop. I will sometimes fish these in a tan or olive color as an alternative to the RFSN or even in tandem in a two nymph rig. In all cases, I’m usually fishing these flies in fairly large sizes – typically in the #14 – #10 range. As the season progresses, I’m more likely to fish them in smaller sizes and lighter colors. You can purchase or tie them in beadhead or non beadhead versions. The non beadhead will typically have lead wire wrapped around the hook under the materials. I personally like the look and profile of the beadless version better. But that’s just one man’s opinion. Try them both and tell me what you think! 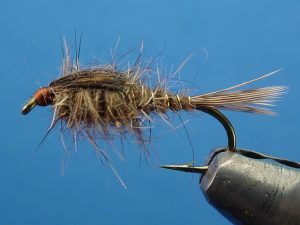 Below is Dave Whitlock’s original recipe for the nymph. I fish the beadhead version most, and I tend to substitute commercial dubbing for the mixes he describes below.